It seemed incredible that three years had passed since I had ventured off of Dominica (with the exception of a day trip to Marie-Galante, French West Indies). A long-awaited trip to Canada was about to unfold for a special celebration: my aunt’s 90th birthday in Nova Scotia! There were other fun things to do and special people to see as well. You’ll read more about it all in subsequent posts. 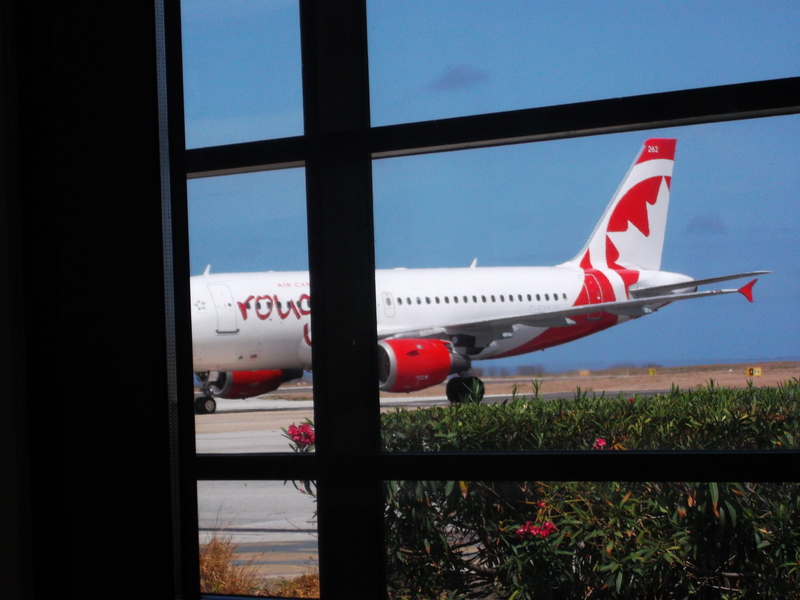 Air Canada at Grantley Adams International Airport in Barbados . Time for me to board that plane and fly north for the summer. A little challenge in living on this lovely tropical island of Dominica is its lack of direct flights to North America. I have always opted to fly to Barbados and overnight there before taking Air Canada to Toronto the next day. I could get to Canada in one day ( if flights are on time and luggage arrives on the same flight) but I find that it is more relaxing to enjoy this popular tourist destination which is historically a Canadian favourite. It is completely different from the Nature Island – except for the friendly people found in both locales. 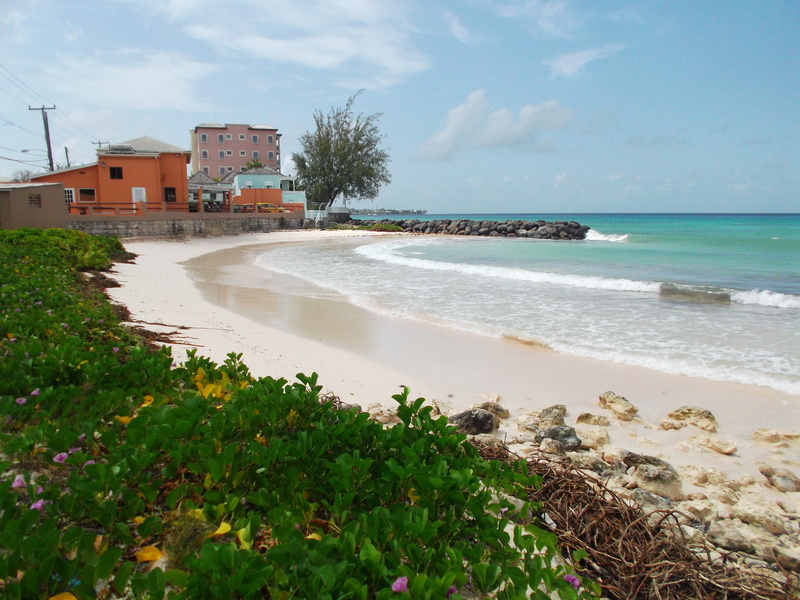 Barbados has loads of pretty white sand beaches all over the island. regulation that planes be ‘dis-insected’ (sprayed) just before take-off. I carry a charcoal-filtered cotton mask and a wet face-cloth. I also cover myself in long pants and sleeves and wear a scarf to put over my head. I also take homeopathic remedies prescribed by my longtime Canadian naturopath, Dr. Shawna Clark, N.D. to help counter the ill-effects of those chemicals. 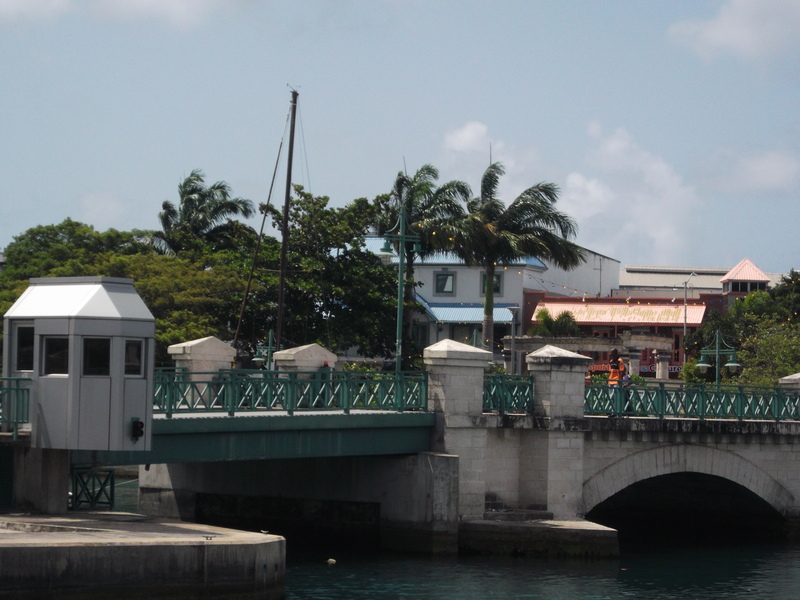 which is about midway between the airport and Bridgetown, the capital city. It is a pretty hotel, modestly priced (ca. $100. 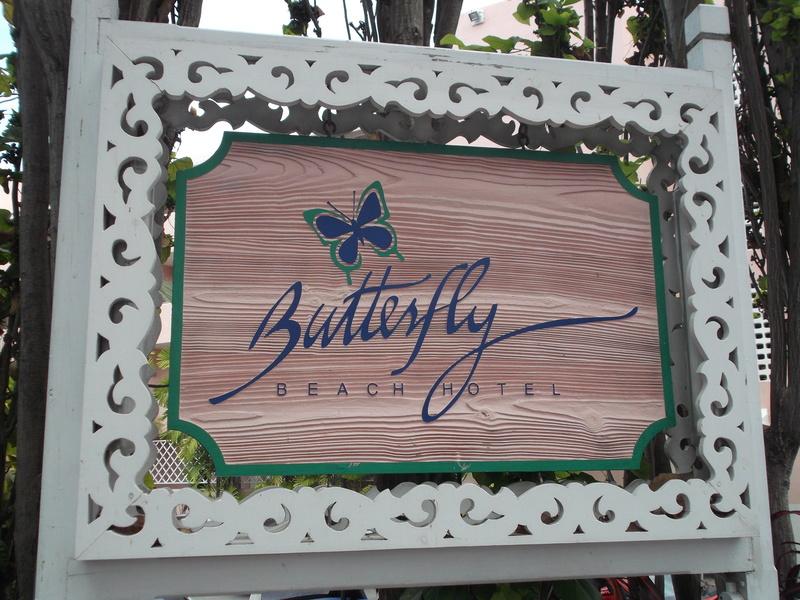 USD per night) and has a lovely bar/restaurant ocean-side with entertainment and a Caribbean buffet on Monday nights. (I always seem to be there on that particular day). It’s quiet and comfortable, with friendly staff. The peaceful setting certainly suits my in-transit status for a one night layover. View from my room at Butterfly Beach Hotel. Fresh breezes and salt air! Of course, on the outbound journey, I was eager to leave the Caribbean for points north and my Canadian adventures. 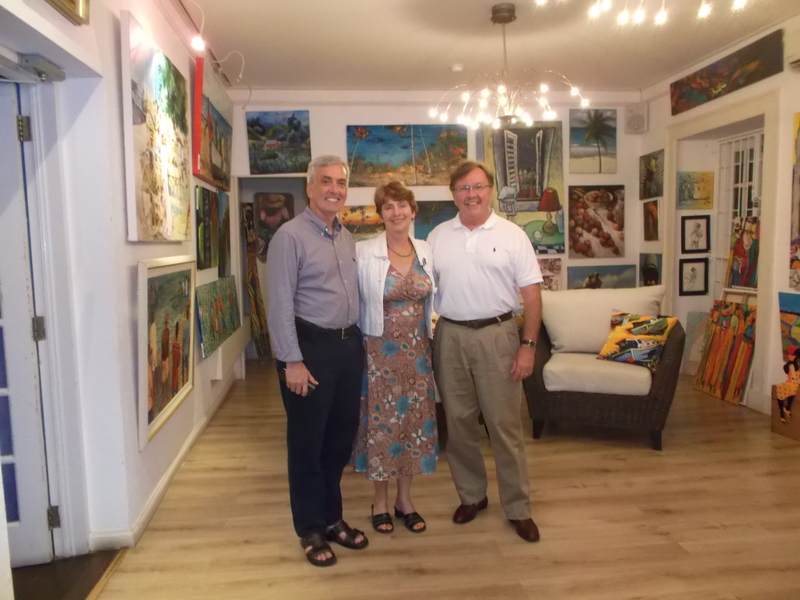 I had hoped to meet longtime friends, David and John, Canadian expats who are presently living in Barbados. Unfortunately, David had a meeting on my pre-departure night, so we rescheduled our rendez-vous for the evening of my return journey. 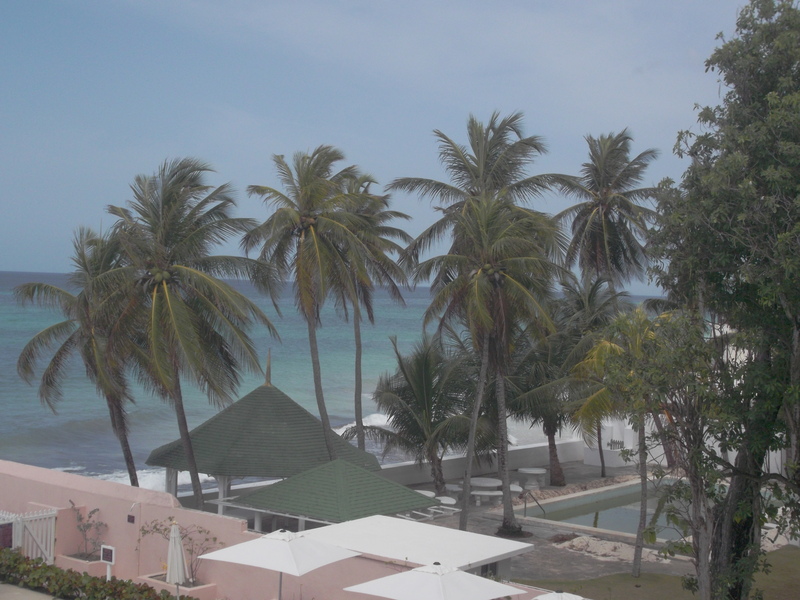 Fast forward five weeks, and I am back in beautiful Barbados again. This time, it’s mid-July and there are sales galore in the city. But first, a few important priorities: an almost-immediate sea bath after check-in at Butterfly Beach Hotel. Then a dinner get-together with David and John. I was glad to have enough time to take a dip before they came to pick me up. I had just experienced an unanticipated insecticide exposure on Air Canada about 15 minutes before landing . I had no idea that they had begun this practise, I assume according to Barbadian regulations, as a method of insect control. Chikungunya, a mosquito-borne illness was slowly creeping into this country. By now, the pronounced effects of this disease were being felt throughout all the other islands – no exceptions. Unfortunately for me, I was not prepared with mask or homeopathics. I grabbed a scarf in my bag to cover my nose and mouth, closed my eyes, held my breath for as long as I could, and hoped for the best! David (l) and John are two of my longtime lifetime friends. I met David in 1977, on the first day of first year as students in the School of Music at Queen’s University in Kingston Ontario. He could tell you a few stories about me. He’s done it before! I was somewhat refreshed after half an hour of bouncing around in the strong Atlantic surf. There was little time to spare as I dressed up for a long overdue get-together with longtime friends, David and John. They were even early (typical Canadians!) and I hastened to meet them outside of the hotel. After greetings and hugs, we headed off to Champers, an exclusive restaurant on the outskirts of Bridgetown. We were seated on the expansive oceanfront porch, with crashing waves providing background sound. We delayed looking at the menu as we were so engrossed in catching each other up on the past few years of our lives. It was a very leisurely meal, as we talked away about life events between bites. My friends had settled easily into their newly adopted country and were really enjoying it. John, an interior designer, had recently joined the Barbados National Trust and had been intrigued by a recent presentation from Dominica’s Lennox Honychurch, PhD about the restoration of Fort Shirley in the Cabrits National Park. I then urged them to come and see it (along with me!) for themselves. I can see why this dining establishment has a superb reputation. The tables were all filled, even though it was a Monday night. I followed David’s lead with a savory Caesar Salad, followed by Cajun Mahi-Mahi. It was sensational – only mildly spicy which suited me fine. I further indulged in dessert: coconut pie with coconut ice cream and tea. My five-pound weight gain was well deserved! After our pleasant reunion, they dropped me back at the hotel where I enjoyed a good night’s sleep. As my LIAT flight to Dominica was not until 2 p.m., I decided to take the bus to Bridgetown and have a look around for a couple of hours in the morning. Unfortunately, I hopped on the wrong bus, and as I did not ask the driver where to stop for the capital city, I overshot it. Fortunately, I asked the passenger beside me when we about 10 minutes longer than what I thought the drive should have been. He and some other riders kindly gave me quick instructions to get turned around and back on track. The bus was packed with people and I am sure I stepped on a few toes as I squeezed through the congested aisle. However, I made sure to loudly thank everyone for their help. It’s called Bridgetown for good reason! Another short bus ride, with specific directions to notable landmarks found me in the centre of the bustling city a few minutes later. I was amazed at the hustle and bustle on the narrow streets and I soon came to realize the reason for commotion on what I thought would be a quiet summer Tuesday. While there were not many tourists about, I noticed that the stores were filling with eager shoppers. Yes indeed, it was sale time on that fair isle! I had read about the famous Cave Shepherd Mall, but honestly, I was ‘shopped out’ from my five-week foray in Canada. My dollars were now scarce and I did not dare to venture inside. That is on my agenda for next time! 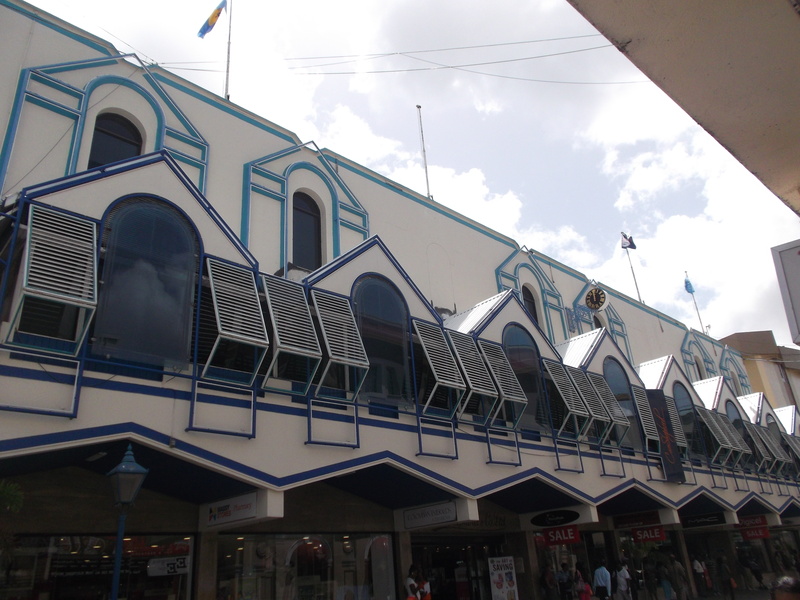 Cave Shepherd Mall on Broad Street seemed to be offering bargains galore in its duty-free shops in downtown Bridgetown. 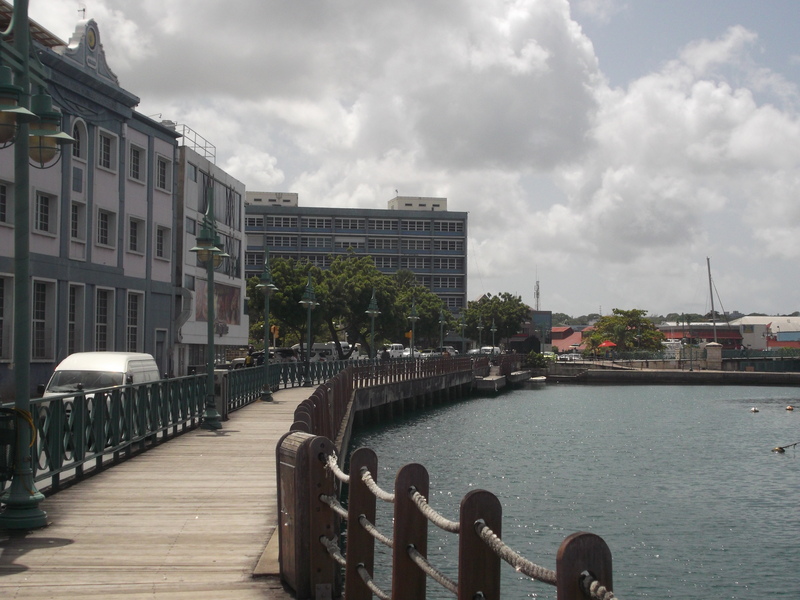 The Bridgetown Boardwalk is a pleasant (but hot!) stroll a few steps from the busy commercial centre. Instead, I wandered around the back streets until I came to the scenic boardwalk. After a stroll in the hot sun, I became aware of my enormous thirst. 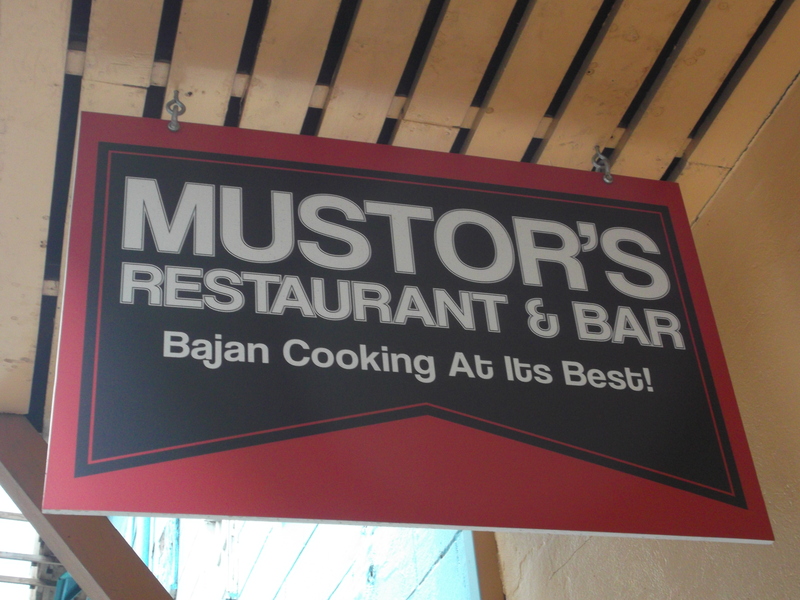 As I looked up a little lane, I noticed a little restaurant called Mustor’s , which is famous for local Bajan food. Mustor’s on McGregor Street is a popular eatery with Bajans and tourists alike. I was a too early for lunch, so the friendly attendant described all the tempting sweet snacks in the enclosed glass case. I chose a coconut cake and homemade lemonade – very refreshing. Lunch there is also on the agenda for next visit! Errol Barrow was the first Prime Minister of Barbados. 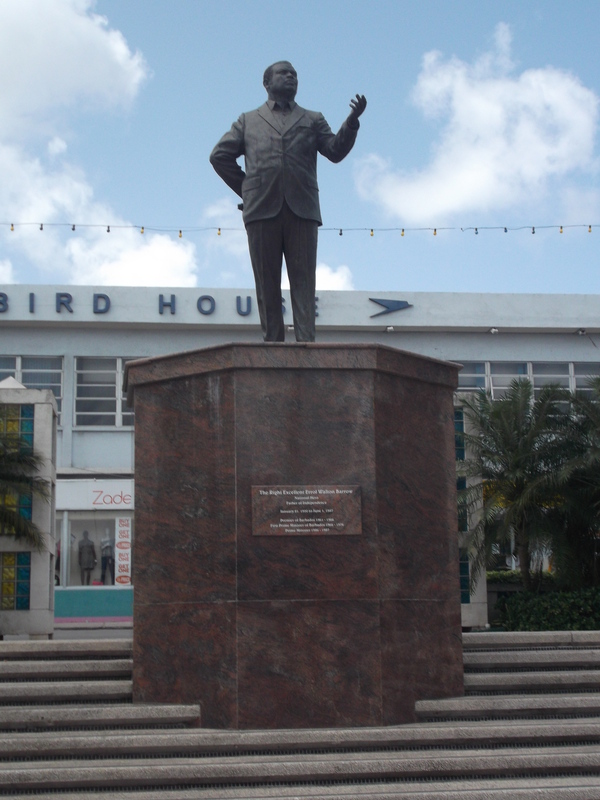 The monument is a permanent tribute to his memory and contribution to the development of Barbados. 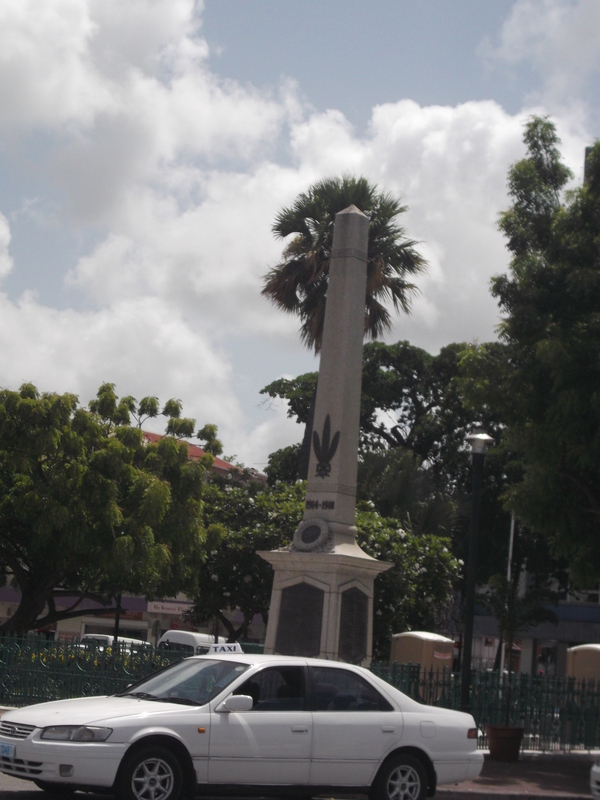 The Cenotaph in Central Bridgetown. 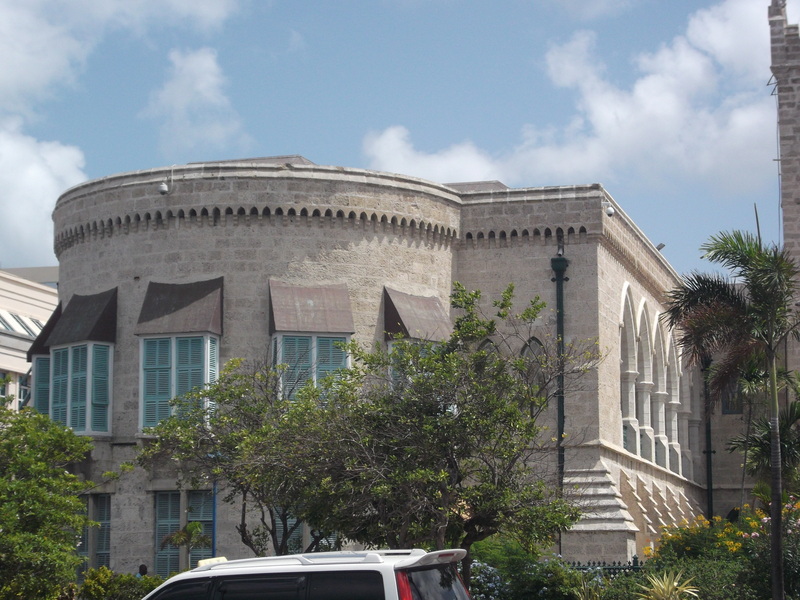 The pretty building stone in Barbados has soft hues. reached the bus terminal, I had just missed the one heading back towards my hotel near the airport. I could have waited for the next one, but I was hot and sweaty and wanted a little quiet and cool down before the last leg of my journey home to Dominica. A taxi took me quickly back to my temporary Bajan base. Then by the time I arrived at the airport, I was more than ready to return to the Nature Island. And there was one last surprise: my friends David and John were heading to Canada for a visit around the same time and lo and behold – I laughed out loud when we actually met by chance at a coffee kiosk in the terminal for one last hug and good-bye for now! By evening, I was back at my home and working up a good sweat after my time spent in a cool Canadian summer. I didn’t mind. I was anxious to rid myself of any residue from the ‘non-toxic’ pesticides I had experienced on both airlines by breathing in the steamy clean air and drinking lots of pure spring water. By now, you’ve yet to hear about the adventures (and there were a few!) of this canary who flew north for a few wonderful summer weeks in Canada. Next post, I’ll tell you more!